Santa Claus... this is a subject I have some strong feelings about. But due to time restraints I'm going to have to skip those for tonight (I could write a book). We are going to go visit the big guy tomorrow, so maybe I'll have time to share some of those thoughts then. It has to do with "lying". Mom, I know we have differing views and I'll leave it at that. 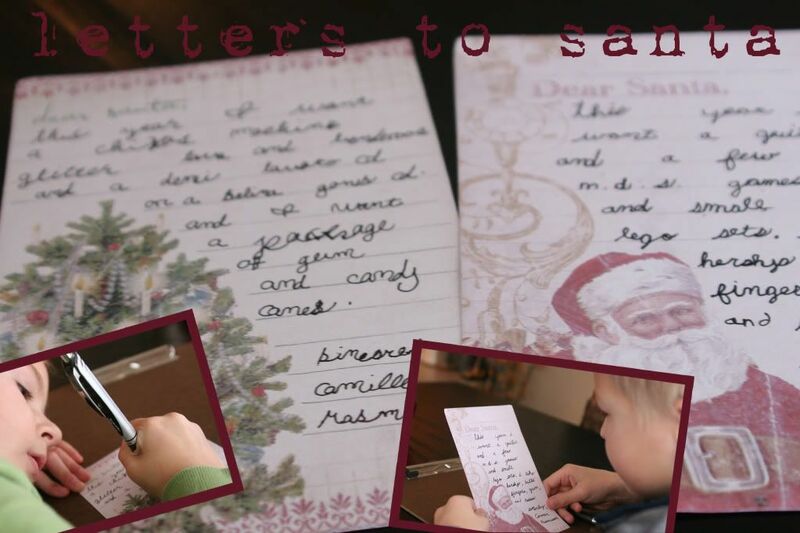 I did, however, let the kids write a letter to Santa. Little Man is a very bright child and figured out there was no Santa when he was 7. He came to us and we had the "it's the spirit of Christmas" talk with him and asked him to not ruin it for his sister. I'm not sure whether or not he told her, but he did manage to tell almost every single person in his school, particularly in his grade, for which we received a couple nasty phone calls from a crotchity old counselor (who has since retired). We continued to ask him to keep it to himself, but what's a parent to do? We are asking him to lie. Pokey still believes (even though she was scared to death of him until she was about 5) and could possibly always, regardless of who tells her otherwise. Although she did ask me the other day how Santa comes down our chimney. I refuse to lie, so I redirect the conversation. Every single day her Santa wish list changes depending on her mood or what Little Man wants, so I'm anxious to find out what she actually asks Santa for. On her hand written note she asked for: chixos, glitter lava (whatever that is), benderoos, demi lavato or selena gomez cd, package of gum, and candy canes. (It's quite a relief because the day before she wanted a nintendo DSI or Wii. Little Man asked for a guitar, a few nintendo DS games, small lego sets, hersheys (? ), butter fingers, gum, and reeses. I forgot to mention that Designer Digitals has a digital Christmas download every day in December for 25 cents. I downloaded these Santa pages last week, so they are probably no longer available for a quarter, but there is something new everyday. They are vintage and I'm still trying to decide if it will work in my "25 Days til Christmas" book or not. If you are interested in the download today you can click here. Or check out designer digitals daily at http://www.designerdigitals.com/. I had another photo shoot today for a family in North Liberty. They live right in front of an elementary school and so we went over there and had a large field of snow to work with. The children are 6 months and 2 yrs and I'm relieved there are a few that turned out. I've forgotten how wiggly they are at that age. How quickly we forget. It's actually the entire reason I got my nice camera in the first place. I used to take photos of the kids and they would be out of the frame before the shutter released. They were a very sweet family and it was fun to work with them. The lesson in Sunday School today was on obeying the laws of the land. Mom, I'll have you know you are supposed to be respecting those in your government, just thought I'd throw that in there. I am not nearly as passionate about certain people as my mother, but they went on for some time before I just couldn't take it anymore and I had to raise my hand. I was experiencing inner turmoil in regards to that topic. Our system is seriously so messed up. We are supposed to respect people even if we don't agree with their policies or think they have any integrity? The sad truth is that it takes tens of millions of dollars to run for president in this country and the person with the biggest wallet generally wins. These people are making decisions that affect mine and my children's lives and I'm supposed to respect them even if I disagree with everything they stand for? Their response was that I needed to write my local congressmen or pray for them. I also have strong feelings about Santa. I never believed him in and therefore never had the tragic moment of finding out he wasn't real that it seems all my childhood friends had. No one in my family tried very hard to make me think there was a santa. Then once they realized I didn't believe in him they tried to salvage what belief I had lost. And it was just weird. haha. I will tell Cohen that it is all for fun and that he isn't real. Also about the "laws of the land". I feel for you. Even though I'm on the other side. What I have found is that anger and negativity didn't serve me well when I was in disagreement with what was going on in our country. It is good to have beliefs and an opinion, but I had to find a positive outlook because my negative feelings only set a stage for negativity to fester inside me. It's not a good feeling, you know? ?